I am really excited to be starting a new challenge on my blog: Cover to cover! This will be when I compare two or more covers of either the same book, books in a series, books by the same author, or just two random books! 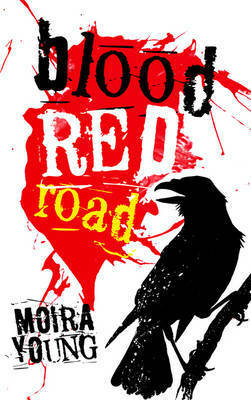 So I have decided to do my first one for a book I recently read, Blood Red Road by Moira Young. Please note this is entirely my opinion. Everyone has their own, so if you don't agree, you don't agree. The first cover is the US version, which is one of the copies I read (don't ask why I had two....). Anyway, this cover really stands out to me. When I saw it on the shelf for the first time, it caught my eye. The large, red words drew my attention without looking too overwhelming. This caused me to pick up the book and read the back, which then caused me to put it on my giant to-read list, which then caused me to pick it up during a time where my stack of books was a tad smaller. Anyway, after reading the book (which was really, really good by the way), I liked this cover even more. The dull, grey background brought out the way the landscape looks, or at least how I pictured it. The clouds of dust with Saba walking forward explained the beginning of the plot extremely subtly while setting the perfect tone for this novel. Overall, this cover was really great and if I were Moira Young, I would be happy with the portrayal of the book through the cover. This is the paperback edition of blood red road. 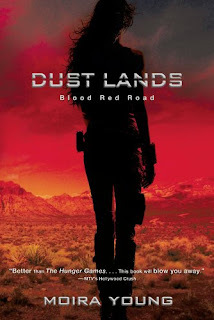 I like this cover also, but somehow the blood red sky and landscape doesn't really click with me. 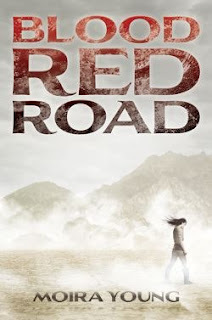 Sure, there is one part where red rain falls, but aside from that, the book specifically describes that the landscape is barren, a bowl of dust. I like the effect of the shadow because it looks really eye-catching without showing the model's face (showing the model's face makes you not able to picture the main character in your head anymore). I do like this cover, but I also don't like how tiny the actual novel name is. That makes you think the novel name is Dust Lands, when it's actually Blood Red Road. But still an interesting cover. I'm sorry, but I cannot STAND this UK cover of Blood Red Road. Believe it or not, there is not a lot of blood in this novel (I KNOW! ), so the big red splatter on the front means nothing. I do like the illustration of the crow (that is prettttyyyy cool), but everything else (to me) is a bit of a mess. There is a lot of craziness going on, and too many colours and everything. This cover doesn't suit the novel in the slightest. The tone is craziness, not sadness, grief, and loss like the real book. Take a look back at the first cover I showed you. Look at the bowed head of the main character, Saba, and how she's fighting her way along with no hope. Now look at this cover. Do they even compare? If I saw this cover, I would possibly pick it up, look at it, and put it back on the shelf. Sorry! Honourable mention to the Paperback cover. Last place? Easily the UK cover. Hoped you enjoyed this! Let me know what your first impressions of each cover are in the comments bar!